As previously discussed, my son is getting pretty good at video games. Because of this, despite being only four years old, I’ve started letting him play Zelda: Breath of the Wild by himself. It has turned out to be a very good decision. If you’re wondering how he manages, he can play the game pretty well in the most basic terms. Things like moving around, shifting the camera, picking up items, fighting enemies, switching weapons, he can understand all of that. And that’s enough for him to get around, see the sights and have some fun. But Zelda’s elegant open-world design means that a lot of the game’s deeper structure is left unexplained. Where you and I as adults may be able to assume things like “the story will unlock more stuff” and “I need better gear”, if he isn’t explicitly shown something—or a system doesn’t work exactly as one has in a game he’s already played—he won’t understand it. Plus, he can’t read. Which doesn’t help. So, like, his map will always be dark and empty, because the idea of having to climb a tower to unlock it is just something he doesn’t get. Ditto the fact things like better armour and weapons are located in villages he’ll never find, and that he doesn’t have to fight everything he sees in the game, and that if your arrows run out, there are no more arrows. (Of course my save game has all these things, but he is never going to get his hands on my gear stash). None of which matters, because he doesn’t care! He has a blast with it, and because he knows I also love the game, he always keeps me updated with his thoughts and progress on it. If he’s playing while I’m working in the next room, I’m treated to a running commentary delivered in single shouted sentences as he finds things that are wonderful and is killed by things he doesn’t understand. 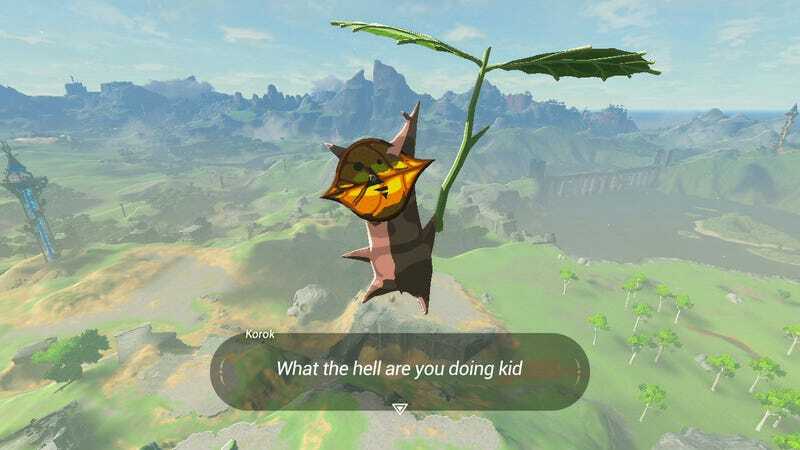 The Korok Leaf. I tried to show him it’s for using wind, but he just wants to hit things with it. Within his first five minutes of playing the game after leaving the initial plateau, he ran into two Stone Talus. He now thinks the map is full of them, and is terrified to go near any and all rocks now. He seems to get cathartic release from killing the little rock monsters, though. When every attack on you is seen as a personal affront, every victory is a personal triumph. I think he thinks that all the enemies on the map are coming from somewhere. And that if he finds where that somewhere is, by interrogating them vocally in the real world, he can shut it down and just walk around the long grass without interruption. I wish that were actually true. Because cooking is a bit beyond him, he replenishes his health by eating stuff raw. That includes his favourite, fish, which he’s surprisingly good at catching, but prefers when it falls from the sky after tapping his Link Amiibo to the controller. An elegant critique of the game’s stupid swimming/stamina system. Welcome to the game’s strictest economy, son. This was after I asked him why he shot that cute lil’ fox with an arrow. Can’t really argue with the logic. I mean, yeah? I think so too. “I died”. It’s so cute I hope he never learns to say this properly. I really miss being a tiny kid and discovering for the first time just how incredible video games can be.